Will you burn a screen for me so I can print my own t-shirts? Hey, that’s really cool that you are interested in screen printing. We don’t offer screen burning services, but the guys at Anthem Screen printing do. They are super cool, total pros, and you’re going to like working with them. I recently ordered from you, can I get ____ more at the same price? It’s always best if you can order a few extras ahead of time, but we know that people come out of the wood work when there are cool t-shirts being made. The simple answer, if it less than a month from your order, 1 color reorders under 12 shirts will incur a $25 reorder fee. 2 color reorders under 12 incur a $40 reorder fee. Reorders of 3 colors incur a $55 fee and so on. If this is not an option, we can use our Direct to Garment Printer (DTG) to print just one shirt. It’s a different process than screen printing, but the artwork will be the same and may just be the best option in this instance. Do you work with people outside of St. Louis to create custom t-shirts? Of course we do! We’ve shipped shirts all over the U.S. and would be thrilled to work with you. We offer great pricing and FREE SHIPPING on orders of $100 or more. Where did the name Tiny Little Monster come from? In 2006, Jenny was drawing a lot of little monsters and making fine art prints and small comics about monsters. She bought the domain name tinylittlemonster.com and just kept it as a portfolio site for artwork and graphic design for a long time. When our custom t-shirt print shop was born she thought, hey, that would be a fun name for our business, and thus a new Tiny Little Monster hatched. We should also mention that Jenny herself is quite tiny herself, and yes, she does have tiny little hands. I’m intrigued, what does your free design review entail? This means we’re going to do our best to help ensure the print is what you are looking for. If your artwork isn’t the right resolution, or the placement/size is wonky (and not in a good way), we’re going to work with you to make sure your order looks right. We don’t just want to print t-shirts, we want to print AWESOME t-shirts. That means we want to help you make your desig look great, and we don’t want you to say, “I can’t afford it,” so we made our design rates as budget-friendly as possible. Check our facebook page for any new positions we have available. You can always send in your resume if you are interested in being part of a fun, creative, hard working team! I just need 1 t-shirt printed, can you do that? Yes! We recently added the Epson SureColor F2000 printer for small runs and multi-color jobs. It’s awesome. For more information, check out our DTG Price List or our handy blog post explaining the DTG process and its benefits! 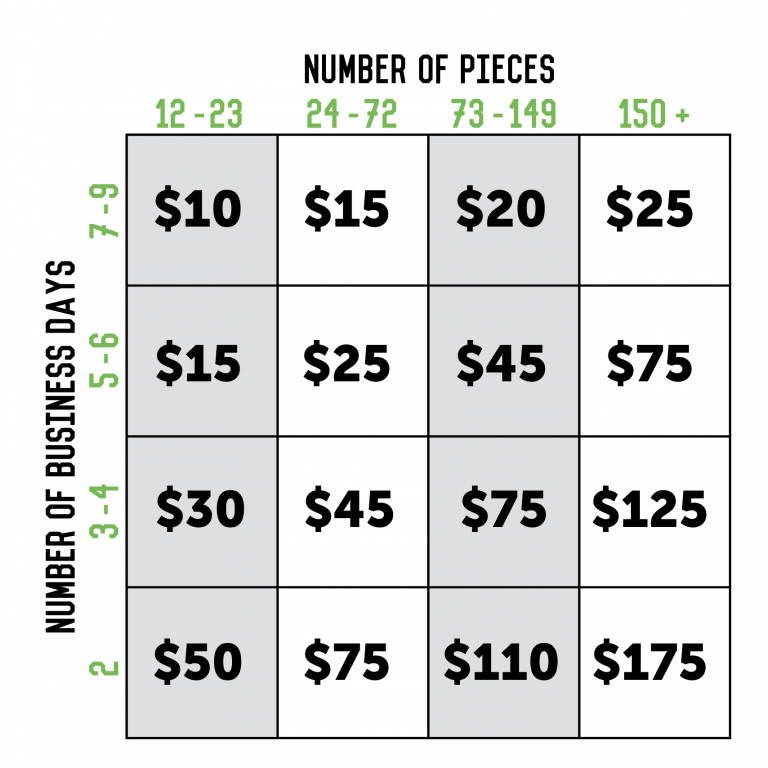 Can we mix sizes, styles, colors, and brands on one order to reach a price break? Mostly likely that’s not going to be a problem: try not to get too crazy, and remember we need to keep the artwork the same color and size to avoid any extra charges. Other than that, go wild my friend. What is the largest t-shirt you tiny little monsters can get? We can get up to 7 XL, but only in certain brands, and we might be limited on colors, too. Most brands carry up to 2XL or 3XL. We can get Tall Sizes too, but again, we’re somewhat limited to a basic color palette. What is the best brand of t-shirt for the best price? We’ve got a lot of favorites out there – value wise, the Anvil 980 is a great soft shirt at a tiny price tag. If you’re willing to spend a little more we love tees by Bella + Canvas, American Apparel and Royal Apparel. It can be hard to shop for t-shirts online, so if you are in the St. Louis area, we encourage you to check out our storefront in Maplewood, we have a lot of samples on hand and can talk to you in person about your project. How do I send my custom t-shirt design to you? Simply upload it to our online design studio. Vector files (remember to outline your fonts) are always preferred because it ensures crisp, clear printing every single time. Vector files will end with .eps, .ai, .svg, and sometimes .pdf. If you aren’t feeling that, email is great, we like vector files, this a file that has the extension .eps, .ai, .svg and sometimes .pdf again. PSD may also work. What is your max imprint size on t-shirts? 13 in. wide by 14 in. tall is the largest size for our tiny handed printing press on adult shirts. Will you print on t-shirts I provide you? Hmm, well, maybe. You see, we get much better pricing on t-shirts than normal folks so its usually better for us to get them for you. Also if we mess up one of your shirts, it’s just going to be a messed up shirt. We don’t replace customer-provided shirts, because we’d be responsible for the retail price, and it’s just not financially viable. Make sense? Can you print an offensive message on a t-shirt? I need t-shirts, FAST, like tonight. Can you help? Possibly, though maybe not, hurry up and contact us already. Same day shirts may be available when you order early enough in the day, and you are available to pick up from our shop in Maplewood. DTG is our quickest, just 3-5 business days, and we even have 24 Hour service for small orders on in stock shirts. Screen Printing is 2 weeks, but you can rush it for a little more to get your tees in a week. Rush Rates start at just $10 for a 7 day turnaround and $15 for a 1 week. Full Rush Screen Printing Chart is here. If you need your order sooner, don’t hesitate to ask. We can accommodate most timelines within reason, but we may need to apply some rush fees to overnight ship apparel and move your order to the top of the queue. Can you print over the seam? Nope, some printers might do that for you, but it is likely to cause ink build up and other issues so we just say pass. We’re perfectionists like that. Simply go to our online design studio to select from our most popular apparel items. Upload or design your tees, get a quote online and submit your order. You can also just email us, we’re really good about putting invoices together (keep in mind we’re open M-F, 10am-6pm) and you can still pay online. Who designed your website / Can you design my website? We made it ourselves. Our co-founder Sloan designed it, we told you our team is talented! Tiny can’t take all the credit, we also had a ton of help from the developers at Jeet Kune Code and Lisa French Designs. The reason you found us is probably because of help from the folks at Heroic Search, who helped us with our SEO and SEM efforts.